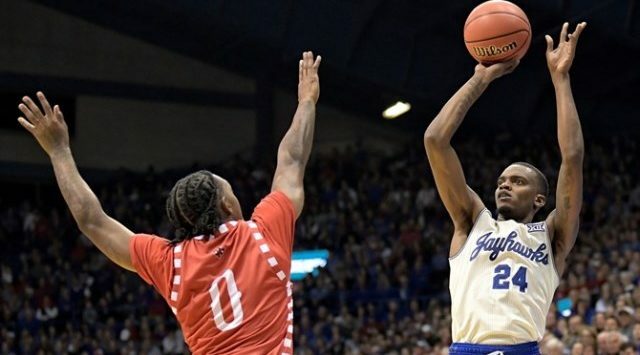 IRVING, Texas – Kansas senior Lagerald Vick posted back-to-back 30-point efforts as he has been named the Big 12 Player of the Week in a vote by a media panel which covers the league, the conference announced Monday. This is the second-straight week Kansas has taken home the Big 12 Player of the Week accolade as redshirt junior forward Dedric Lawson was last week’s honoree. Vick opened the week scoring a then-career-high 32 points in Kansas 84-68 win against Vermont on Nov. 12. In the game, the Memphis, Tennessee, guard broke the Big 12 and Kansas record for most 3-point field goals made without a miss by going 8-for-8 from beyond the arc. Vick’s 8-for-8 effort was two shy of the NCAA record and his eight treys tied for the second most made in Kansas history. In Kansas, 89-76 win against Louisiana on Nov. 16, Vick scored 33 points, surpassing his career high set earlier in the week. Once again Vick was sharp shooting from 3-point range, making 7-of-12 from beyond the arc. KU’s lone senior just missed a double-double against the Ragin’ Cajuns as he pulled down nine rebounds in the win. For the week, Vick averaged 32.5 points and shot 23-for-32 (71.8 percent) from the field, 15-for-20 (75.0 percent) from 3-point range and averaged 6.0 rebounds. Vick’s 15 3-pointers in the two contests set a Kansas record for most 3-pointers made in consecutive games. No. 2 Kansas (3-0) will take on Marquette (3-1) on Wednesday, Nov. 21, in the NIT Season Tip-Off at Barclays Center in Brooklyn, New York. The contest will start at 6 p.m. (Central) and will be televised on ESPN2.